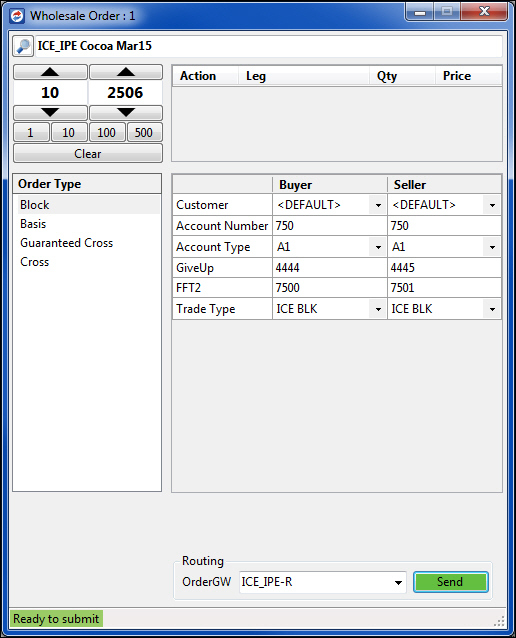 You can use the Wholesale Trades window to make cross trades on ICE when connected to ICE Gateway 7.17.45 or higher. Cross Trades: prearranged trades with either a party within the trading firm itself or with a specified party outside the firm. Ensure that wholesale trading is enabled for your username in TT User Setup. Contact ICE to enable the wholesale trading functionality. If you plan to use Auto RFQ in the Wholesale Order window to set your own time interval between RFQ and submitting the order (RFC), contact the exchange or refer to the exchange rules for the correct time interval for your product. 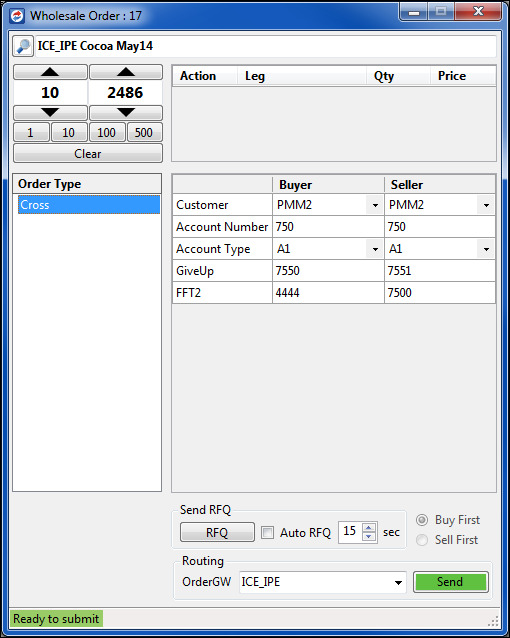 Select a Wholesale order type from the Order Types pane and set the quantity and price for the trade. For a description of each field, refer to Common Wholesale Trade Fields for ICE. For Basis trades, also refer to Additional Fields for Basis Trades. 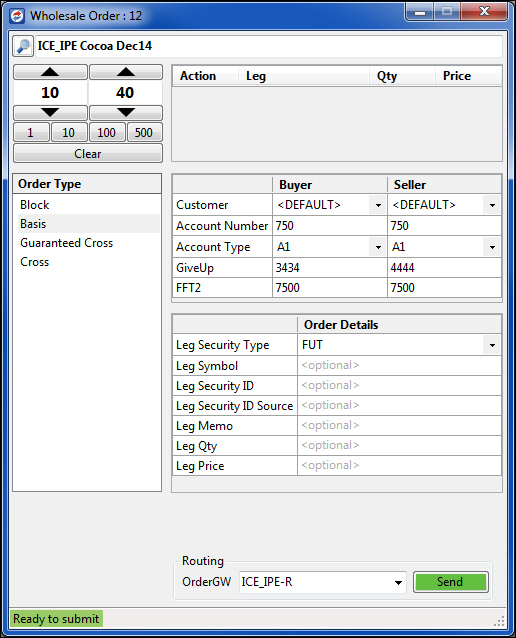 For Block trades, also refer to Additional Fields for Block Trades. Once the fields are complete, click the Send button. Review the Confirm Order window that displays and click Yes to submit the order. Cross trades: Upon receiving the order, the exchange broadcasts a request to cross message that appears in the Audit Trail. After the exchange-defined time period (e.g., 10 seconds), the order is submitted. The table below lists the common fields for submitting ICE wholesale trades. For Cross trades, these are the only applicable fields. For additional wholesale trade types, you must also complete the additional fields listed the sections that follow. TT Account. May be populated from Customer Defaults. Required for both sides of the cross trade. Refer to ICE Gateway Account Types in the Help Library. Sets the type of account for submitting the trade. Sets clearing firm information and is populated from the Giveup field in Customer Defaults. This field is required for both sides of the trade. Sets the customer specific information and is populated from FFT2 in Customer Defaults. To submit Basis trades, you must first complete the fields listed in Common Wholesale Trade Fields for ICE. In addition, you must complete the Order Details section as listed below. Optionally, select one of the following product types: FUT -- futures, OPT -- options, CS -- cash. Optional if a leg security type is selected. The following figure shows additional fields for Basis trades. To submit Block trades, you must first complete the fields listed in Common Wholesale Trade Fields for ICE. In addition, you must complete the Order Details section as listed below. ICE EFRP -- exchange for related position trades. ICEBLK -- ICE block trade. EFM Trade -- exchanges positions from Brent contracts to Brent NX contracts. CCX EFP Trade -- exchange for physicals offered by CCX. N2EX -- trades for energy contracts offered by N2EX. EFP Trade -- exchange for physicals only trade. EEX -- European Energy Exchange contracts. EFS/EFP Contra Trade -- EFS/EFP trade to be executed within the contra period. EFR Trade -- exchange for related positions trades. EOO Trade -- exchange options for options trade. EFS Trade -- exchange for swaps only trade. The following figure shows additional fields for Block trades.